Ledgetop counter has a 22 in. 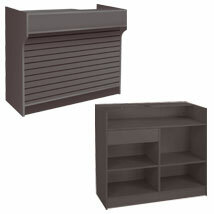 D recessed ledge to hold most standard cash registers. Inside includes shelves and a drawer for storage purposes. The slatwall front can be used with peg hooks, shelves, or any slatwall accessory to fit your store`s unique needs. Item ships assembled.